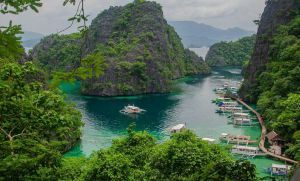 A midway point in getting to Baguio – the Summer Capital of the Philippines – Agoo is mostly a town known as a stopover than a tourist destination. Agoo does have a simplistic nature about it, but that doesn’t mean it doesn’t have some wonders of its own. While it may not be as popular as its northern neighbors, the town does boast of some wonderful structures that highlight its history and culture. Agoo receives its fair share of visitors during Holy Week. The town is known for its church, the Basilica Minore of Our Lady of Charity which is hailed as one of the most beautiful in La Union. Another feature the church is known for is the large oil painting located behind the main entrance – the two angels in the foreground are done in the image of Imelda Marcos (former First Lady of the Philippines) and Mrs. Aspiras (wife of Jose Aspiras, a native of Agoo who commissioned the painting when he was Secretary of Tourism in the 1970s). All in all, there really isn’t much to see and do in Agoo. Then again, not unless you’re the type who loves peace and quiet. Far from the madding crowd, so to speak. 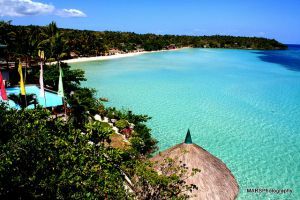 Agoo was part of the province of Pangasinan before the Spanish arrived and before the province of La Union was established. The Japanese were the first who settled into the area where they helped shaped Agoo’s coast to be suitable for foreign vessels coming into Lingayen Gulf. In fact, the area was referred to as “El Puerto de Japon” or the Japanese Port by Miguel de Loarca. When the Spanish arrived, the role of Agoo as a port town deteriorated – the Spanish closed the Philippines off to foreign trade. Juan de Salcedo, a Spanish conquistador, was ordered to explore Northern Luzon by Miguel Lopez de Legazpi after his successful exploits in Southern Luzon. He came upon Agoo, which was already settled by the Japanese who eventually left but not without leaving behind some knowledge to the locals about their methods of fish culture, rice cultivation, deerskin tanning, duck breeding and weapons manufacturing. By 1578, two Franciscan missionaries – Fray Juan Bautista Lucarelli of Italy and Fray Sebastian de Baeza of Spain – constructed a thatch and bamboo church in honor of Saint Francis of Assisi. They named the town after pine-like tress called “aroo” or “agoho” which dotted the riverbank at the time. The Augustinians took over from the Franciscans and were responsible for the development of Agoo. Later on, La Union was created by Governor-General Antonio Maria Blanco on March 2, 1850. To form the province, northwestern towns of Pangasinan, along with some from Ilocos Sur and Agoo were integrated. Basilica Minore of Our Lady of Charity – constructed by the Augustinians. Imelda Park – a small park dotted with old acacia trees and some tropical flowers. Highlights of the park include the fountain located in the center and the Agoo Tree House which offers panoramic views of the area. 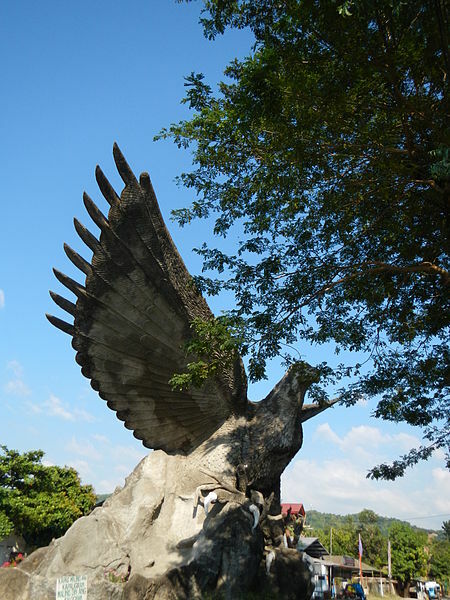 Eagle Monument – a symbol of Agoo and one that marks the start of Marcos Highway, the road that leads to Baguio.